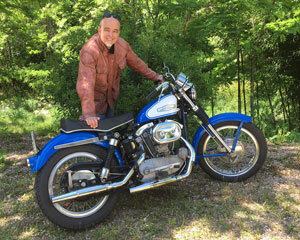 I bought the motorcycle in May 2015 and in the two attached pictures, show the bike as I have bought, in very good general conditions, ready to ride. 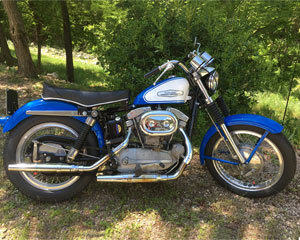 The seller, a collector owner since 2008, was able to find an original seat (made in Italy !!! Sorridente [smiley face]) bought on ebay USA, paying many hundreds of dollars. 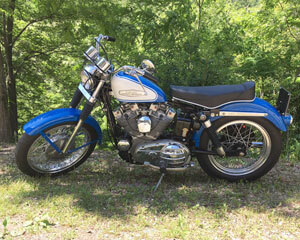 I have done some adjustments to bring it to the original, such as changing the sprocket cover, the high beam lights indicator lens, rear footpegs, kick starter pedal, and now will change the rear shocks. The front fork has been securely fastened to the frame neck and the speedometer has been run. 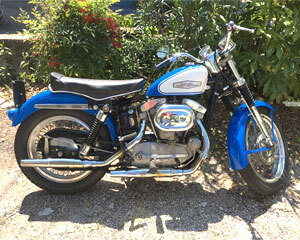 The bike was imported to Italy and registered in the historical register in 1999 and the pictures of the certificate show the bike in the same conditions as when I bought it. 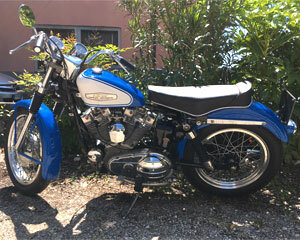 I do not know if it was found in such conditions in the USA or was restored in italy but I I think it has been restored in Italy to be resold by a known classic motorcycle enthusiast, who buys and resells. The bike has the Italian license plate and I'm the third owner since 2003. I use it only in the weekend or in my spare time and only when the weather is sunny between May and September. I ride it along the city streets and the surrounding areas because I have a short distance to Alps mountains and Lake Garda. Overall I did not use it so much, last year I ridden the bike for about 700-800 miles.